Stasis Labs has developed the Stasis Monitoring System (SMS), a bedside monitoring system along with a portable tablet that serves as a patient chart because many patients remain in ICUs past the point of needed care, and need only to be monitored. In this pilot, the SMS was implemented in beds across multiple Narayana Health hospital non-ICU wards in the Bangalore Medicity Branch in order to decongest the intensive care unit and improve operational efficiency. 630+ patients were monitored on the SMS over the pilot period. The primary pilot objective was to understand whether clinicians and nurses are able to use the product effectively to improve the quality of care for their patients. Clinicians agreed that the product improves the quality of patient care. Nurses in the high acuity areas of the hospital found most use for the SMS. 100% of the nurses in the high-acuity area agree that SMS is easy to use. 91% agree that SMS improves care. As part of the pilot, patients were also escalated to the ICU for further care based on clinical assessment of long-term trends. 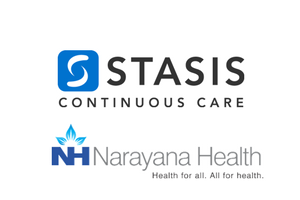 The pilot provided several business-related insights that will help Stasis plan, manage, and execute an effective sales process with large corporate hospitals across India.